A sign for the roadside attraction that has brought thousands to this small, tech-industry town. SUNNYVALE, CA—The wonder in 8-year-old Hayley Dunbar's face as she stares out over what locals claim is the world's largest website makes it easy to understand why she and her father, Tom, drove all the way from Eugene, OR to see it. "Wow, look at all of the links—I can't believe how huge it is!" squeals Hayley, whose family is among the 200,000 people ex-pected to make the trip out to California's Santa Clara Valley this year to catch a glimpse of the marvel. "How did they make a website so big, Daddy?" To curious travelers† like Hayley, TheWorlds LargestWebsite.com, located in the center of town and featuring thousands upon thousands of long, scrolling pages of text and images, is an impressive computer-age curio. But to the people of Sunnyvale it's much more than just a roadside attraction: It's a point of pride—and an economic boon—in a corner of Silicon Valley that has been all but forgotten since the late '90s. "After the bubble burst, we didn't have too many visitors coming through these parts," said Melinda Hamilton, mayor of the community that is now unmissable thanks to the billboards counting down the exits for 200 miles in all directions. "But once word got out that we had the biggest website among all seven continents, that changed in a hurry. People from every walk of life suddenly wanted to make the trip to see the trillions of digits of HTML code and countless Java applets in person." The world-record holding website, as well as the dozens of restaurants, hotels, and souvenir shops that have sprung up nearby, has, by some accounts, saved the local economy, and word of mouth continues to send more and more tourists to catch a glimpse of the famously vast scroll bar with their own eyes. According to its creator, Edward Capron, the site originally started in 2003 as a personal home page in his garage, but soon grew so large that he had to move it into his backyard, and finally to its current location in the center of town, where awed onlookers can admire its gigantic URL, as well as its seemingly endless site map. "I wasn't trying to set a record for the world's largest website or anything, I just kept building on to it, and before I knew it I had a real whopper on my hands," said Capron, who claimed he knew he had created something special when friends and neighbors started lining up around the corner to sign the massive guestbook. "Most people assume it's some sort of hoax at first, but once they come out here and see all the message board and search result pages for themselves, they're pretty wowed. Definitely something worth telling the friends back home about." "I know the folks out in Fremont say they've got the largest website, but I saw it and it's not even half as big as the one here," Capron added. "And ours doesn't use any tricks or mirrors to make it appear extra-large or anything like that. It's the real deal." 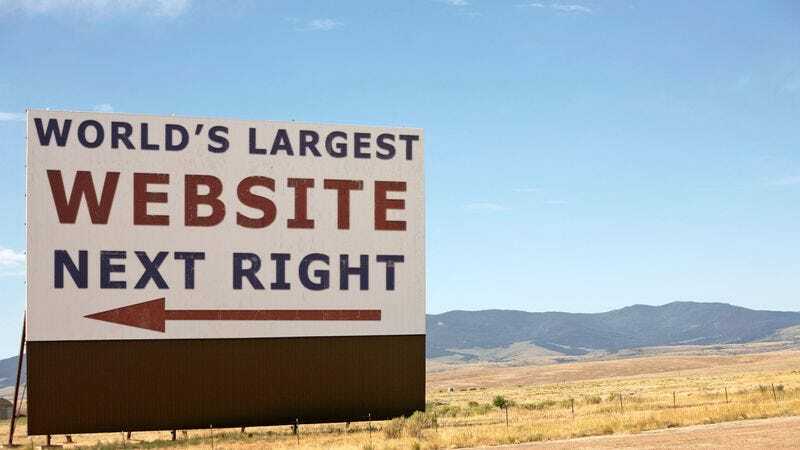 According to locals, the town is constantly beset by website enthusiasts from around the globe who arrive with precision instruments, hoping to measure TheWorldsLargestWebsite .com themselves and discern its true dimensions. Each walks away as stunned and dumbfounded as the last. Meanwhile, as revenue from TheWorlds LargestWebsite.com T-shirts, mouse pads, and postcards continue to augur a brighter economic future for Sunnyvale, the reactions from visitors so far have been, to say the least, very encouraging. "Usually these kinds of things end up being real tourist traps, but this was worth the detour," said Kevin McQuillan, 51, after posing for a picture with the site's FAQs. "We're definitely going to come back again when the Frequently Asked Questions page isn't under construction." Still, not all have been impressed by TheWorldsLargestWebsite.com's magnitude. Bill Jaffe, 45, who saw a road sign and decided to stop by the site during a cross-country trip last year, left disappointed. "Maybe I came at a bad time, but all I got was a frozen hourglass and this huge error 404 message," Jaffe said. "Frankly, the whole thing just looked kind of fake."